Several manufacturers and types, e.g. Add devices in z-wave network. When failed, remove them again via "Settings -> Z-Wave -> Remove a device"
And if pairing failed, removal via "Settings -> Z-Wave -> Remove a device"
Since updating to 1.5.8 adding and removing z-wave nodes have deteriorated severely. When trying to add e.g. the blinds I'm trying to make an app for, pairing fails something like 9 out of 10 times now, the last couple of weeks, it has been totally opposite - fail rate has been something like 1 out of 25 - and that due to problems in my code. Now, most of the times the pairing stops at some point (mostly while retrieving command class versions, not at any specific point, can be after retrieving 9, 12, 15, or 16 of 17 classes when it's the blinds). After failed pairing, removing the node via "Settings -> Z-Wave -> Remove a device" now also fails most of the times - although the device is set in "Learn mode" removal fails and error message No device for removal found shows. New error message appeared: Could not remove a device; the device could however be removed on next attempt. Furthermore, when removal finally results in "Device succesfully removed", the next pairing attempt may still result in a message stating the device is already paired with Homey. Initially I thought the reason was heavy polling on some Powernode 6 devices, but this seems not to be the case afterall (nothing really changes when disabling the app and physically unplugging the devices). As I thought this was post probably something with my code for the blinds, I tried adding the Neo and Fibaro devices mentioned above (had some unused) with the devices mentioned above. All have been paired with Homey before and worked flawlessly. All pairing attempts have been done, re-done, re-re-done at different distances from five cm to 0,5-1-2 meters. Homey has been rebooted a conutless number of times, PTP has been tried as well. The result stays more or less unchanged. As mentioned, during the last weeks I have paired and un-paired the same devices litterally hundreds of times - and something has definitely changed - and disabling apps and flows trying to minimise traffic load on the z-wave mesh has not solved the time outs experienced. I have noticed a behavior similar to that described in #2326 with "Unknown node" but have not been checking this systematically and cannot say for certain that it is in fact the same pattern. Same issue here. Cannot delete a device anymore from devices page. 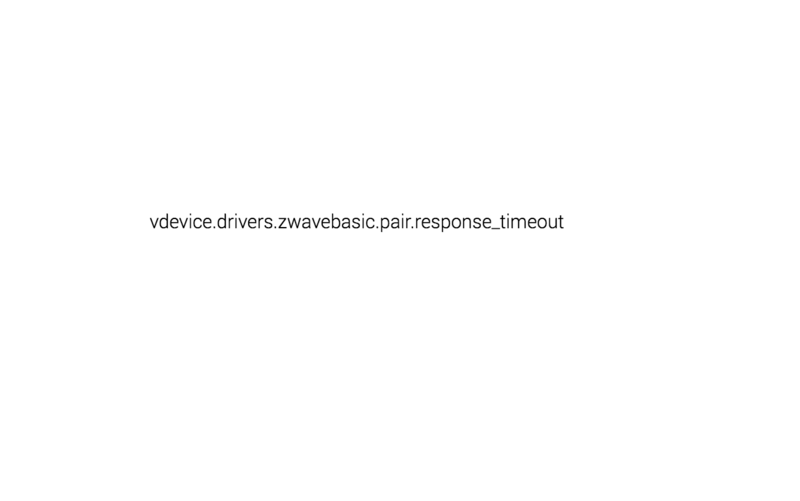 vdevice.drivers.zwavebasic.pair.response_timeout is what i get. Device was removed ok with the zwave-delete device but is still on devices page. Having the very same issue as @Rocodamelshe. Removing of Z-Wave device went OK but device is still shown. When trying to remove from the device page the error occures. Same issue here, tried to remove a device and same timeout error. Having the same exact issue. My MCO TouchPanel died. So I have to forcefully remove the Z-Wave device but I’m unable to do it. After 30s, this error will show up and Homey doesn’t remove it. It worked before. I have the same error, the device is excluded. But it stays in the devices menu. Same for me on Firmware 1.5.13-RC9 on a Neo CoolCam plug. Was unable to remove it (in the Android Homey Preview app) so used Settings > Zwave to remove the device. However the device is still on Homey and have been unable to remove it resulting in a message: "vdevice.drivers.zwavebasic.pair.response_timeout"
Oh yes, this finally works by using the "remove" button in the developer section when you have 1.5.13.RC11 installed. Thanks for the hint @Inversion-NL ! Works for me but (possibly a different topic) the range seems to be reduced now. To communicate with a Quibino shutter dc I now need to have Homey in the same room. Move it to the next room (about 10m away and one wall) and it's No longer communicates. I am on stable 1.5.12 so it looks that I need to have a little more patience. When i go to Athom Developer then "This page requires that the selected Homey matches firmware version >=2.0.0. The selected Homey Homey is version 1.5.12."